The NDEF Library for Proximity APIs / NFC has been updated to v3.1.1, which now adds full support for Windows 10! This means you can now seamlessly use the full library including the platform extension in your Windows 10 / UWP apps. To provide a starting point for your apps and experiments, a new version of the NdefDemo-App is available for Windows 10. It showcases several features of the library, and makes it easy to test the NFC capabilities of your device. To make testing even easier, the demo app is now also available in the Windows 10 App Store. In addition, a new class is available in the base NDEF library – it supports creating records that launch the Windows 10 settings app on various specific pages, including settings exclusive to PC or mobile. Due to the platforms moving on, two other record creating classes have been deprecated: NdefNokiaAccessoriesRecord and NdefWpSettingsRecord for Windows Phone 8. Another change is the addition of a target title for the DriveTo and WalkTo types of Geo Tags, which now allow better navigation to places on Windows 10 with its new maps app. The new library version is available on NuGet for easy integration into your own projects. You can also download the source code on GitHub, or the new Windows 10 NdefDemo app from the Windows Store. Thanks to the report of a user, I could identify and fix an issue in Bluetooth Beacon Interactor with the dark theme on the latest Windows 10 Mobile release. The update to v1.4 fixes the app – it’s already live in the Windows 10 Store, the source code is available on GitHub! Based on user feedback, I’ve improved the Bluetooth Beacon Interactor. It now allows clearing all the visible information about beacon advertisements that have been found so far. Very useful for testing scenarios, as well as for better monitoring of beacons in your surroundings. Thanks for your suggestion! The updated app is available for download in the Windows 10 Store, the source code has already been updated on GitHub. 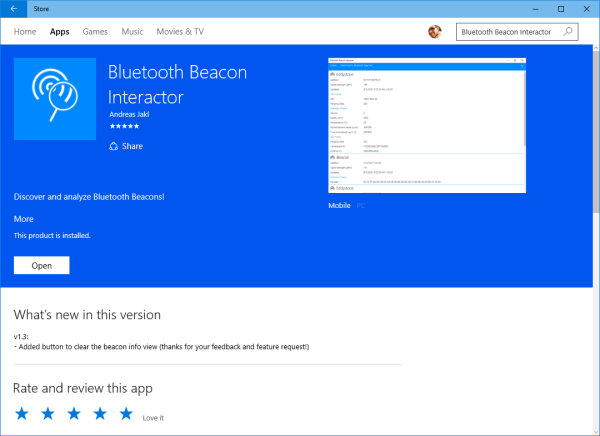 The well-known NFC interactor app just got a new cousin – the “Bluetooth Beacon Interactor” app is now available for free download from the Windows 10 store. 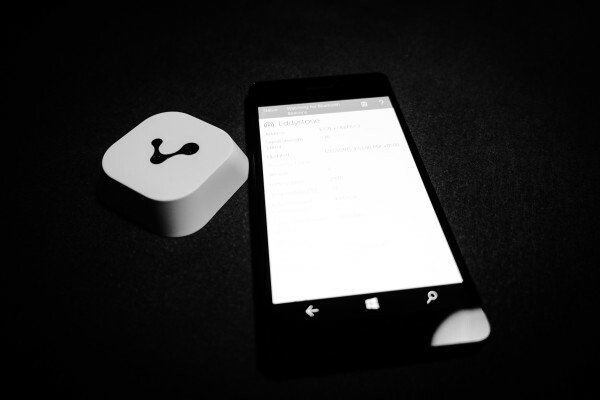 It’s the world’s first Bluetooth Beacon scanning app for Windows 10 and lists all the information about nearby beacons in a clean and modern design. In addition, it understands the new Eddystone™ specification, an open Bluetooth® Smart beacon format from Google. This means that you will see all the transmitted information, including the beacon temperature, URLs (physical web) and much more. The app works on Windows 10 PCs, laptops, tablets and smartphones. Even better: the whole app is available as open source code for developers! It’s the sample app for the Universal Beacon Library, which you can use to easily integrate Bluetooth Beacons into your own Windows 10 UWP apps. The code is available via GitHub, and you can easily integrate the library into your apps through NuGet. The official NFC Forum has created the product showcase to spread the word about the impact of NFC technologies and to spark ideas for entrepreneurs and developers. 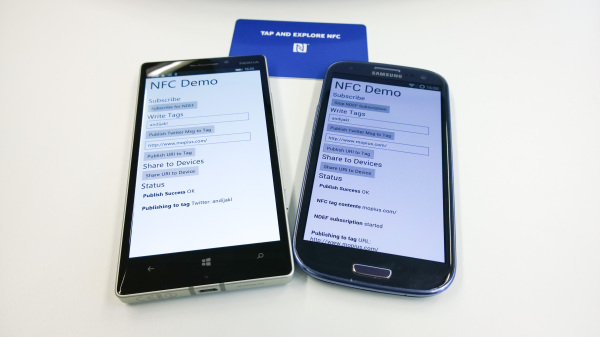 Being the most powerful NFC tool for the Windows platform, NFC interactor is an integral part of very NFC creation process. To check out NFC interactor on the NFC Forum product showcase, click here. 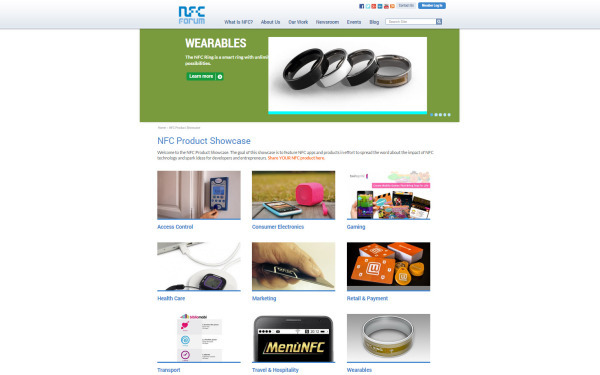 Browse through the rest of the catalog to see many more interesting NFC ideas and products! 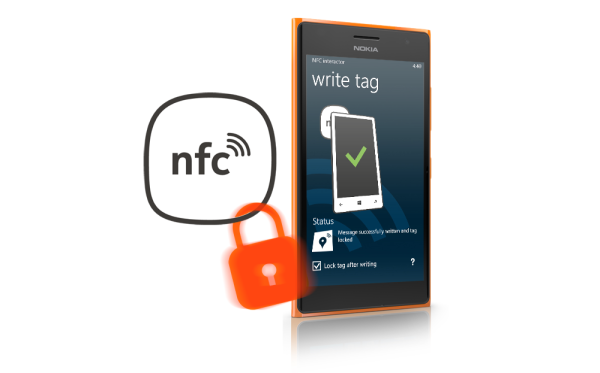 Memory is scarce on NFC tags – the new NFC interactor 7.1 update helps you optimize your contents by showing you the live message size while you compose your NFC tag contents. Additionally, the new release adds a bunch of new Windows Phone 8.1 system apps, enabling you to launch the latest features like Cortana or VPN. 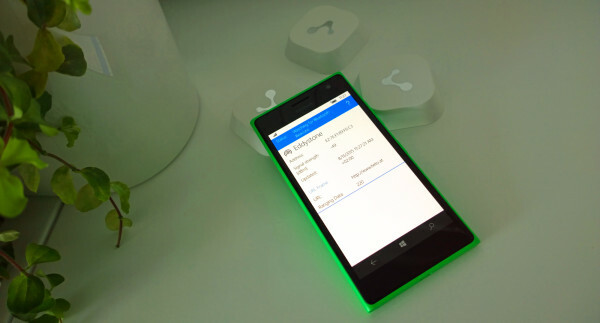 The new NFC interactor 7.1 is available for download for all Windows Phone 8(.1) devices that support NFC. If you have previously purchased the app, it is a free update – your phone will notify you automatically.